At only 24 years old, Jan Lisiecki has been called a “prodigy” (CBC), “the most ‘complete’ pianist of his age” (BBC Music Magazine), and even a Mozart of our times. Interviews suggest that Lisiecki rebuffs such labels. What’s certain is that those lucky enough to see him perform at this age are privy to a golden moment in the artist’s trajectory. While he’s achieved a level of musical mastery that would be the envy of most mature musicians, he can still be seen, luckily for us, playing in merry prairie venues — where the average concertgoer won’t be forced to squeeze into some far-off ‘standing-room’! The rise of Lisiecki’s star has been meteoric. Born in Calgary to a Polish family of non-musicians, he began playing the piano at age five after a school counsellor suggested to his parents that they ‘impose’ conservatory music lessons on him. But apparently he did not, like so many of us, rebel against the rigours of this regime, quickly wowing his tutors with his natural musical talents. Six or seven years later, those talents caught the attention of musical heavyweight Howard Shelley, who went on to conduct Lisiecki in recordings of Chopin. 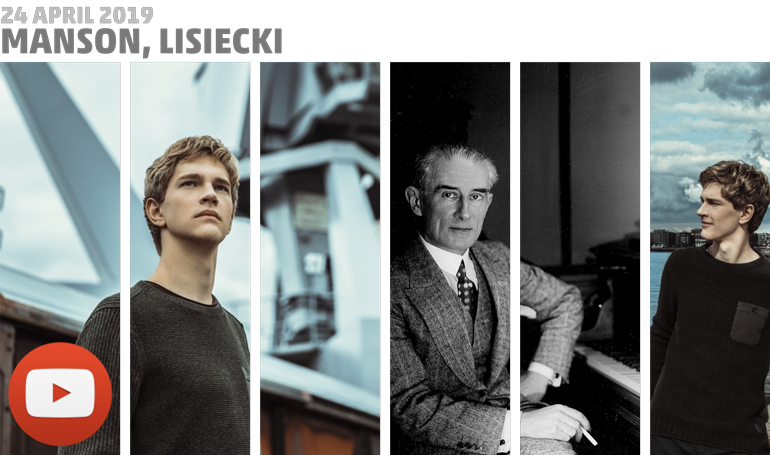 Today Lisiecki shares the stage with the likes of Yo-Yo Ma and James Ehnes on stages such as Carnegie Hall and the Philharmonic Concert Hall—in addition, of course, to Westminster Church, where he’s already performed with the MCO three times. At our April concert, Lisiecki will strut his stuff, performing a piece that demands swagger: Ravel’s wonderfully flamboyant, jazz-inflected Piano Concerto in G major. Composed (1929-1931) at a remarkable moment in music history when popular American jazz and European modern music struck up a fleeting affair, the concerto evokes the decadence and confidence of the Roaring Twenties. Notwithstanding its raunchy character, the work is the product of almost obsessive meticulousness. The concert begins at 7.30pm (doors open at 6.30pm) on April 24th in Westminster United Church, 745 Westminster at Maryland. (Click here for matinee concert details.) Tickets, at $35 for adults, $33 for seniors and $15 for students and those under-30 (incl. GST), are available at McNally Robinson, Organic Planet (877 Westminster Ave), and on MCO’s Ticketline at 204-783-7377. Please note that our one-hour 1:00 pm matinees have a slightly shorter program and no intermission. At 24, pianist Jan Lisiecki is already recognized as one of the greatest pianists of our time. Acclaimed for his extraordinary interpretive maturity, distinctive sound and poetic sensibility, he is “a pianist who makes every note count.” (New York Times). Lisiecki’s insightful interpretations, refined technique, and natural affinity for art give him a musical voice that belies his age. In 2017, Jan received the ECHO Klassik, Germany’s most significant classical music award, as well as the JUNO Award, the most prestigious recognition in the Canadian music industry, honouring his fourth recording for Deutsche Grammophon, featuring Chopin’s rarely-performed works for piano and orchestra with NDR Elbphilharmonie Orchester and Krzysztof Urba&nacute;ski, Lisiecki performs with the world’s most prestigious orchestras on major stages and has worked closely with prominent conductors including Sir Antonio Pappano, Yannick Nézet-Séguin, Daniel Harding, and Claudio Abbado. Recent highlights include recital tours of Europe and Asia and subscription debuts with the Boston Symphony, Pittsburgh Symphony Orchestra, Wiener Symphoniker, and Sächsische Staatskapelle Dresden, among others. Jan Lisiecki celebrated great success with his highly acclaimed recital program ‘Night Music’ which he will continue to perform in the 2018/19 season. In 2018/19 he will return to Carnegie Hall for a performance with The Philadelphia Orchestra, Lisiecki will tour with Orpheus Chamber Orchestra through Europe as well as with the Czech Philharmonic in Germany. Other collaborations include NDR Elbphilharmonie Orchestra and concerts in Salzburg with Mozarteum Orchestra. In 2013 he became the youngest ever recipient of Gramophone’s Young Artist award, and also received the Leonard Bernstein Award at the Schleswig-Holstein Music Festival. Jan Lisiecki is an exclusive recording artist with Deutsche Grammophon. In 2012, Jan Lisiecki was named UNICEF Ambassador to Canada. Numerous front-rank British composers, including Elgar, Vaughan Williams and Holst, have found writing for the rich, expressive and flexible medium of the string orchestra a highly congenial practice. The British repertoire for strings received a major stimulus when the Anglo-Canadian conductor Boyd Neel (1905-1981) founded a virtuoso string orchestra in 1933. With it, he offered training and performing experience to the finest young players, and a vessel through which composers from Britain and abroad could express themselves. Within two years, the Britons Arthur Bliss and Michael Tippett had created works especially for Neel’s orchestra. Neel resumed his original profession as a doctor during the Second World War, but in 1953 relocated to Canada and from then on focused exclusively on music. He conducted the first recordings of major string orchestra scores by Vaughan Williams (Fantasia on a Theme by Thomas Tallis) and Britten (Simple Symphony); commissioned the work that launched Britten’s international reputation, the Variations on a Theme of Frank Bridge; and received Britten’s Prelude and Fugue as a tenth-anniversary gift to him and his orchestra. Britten composed his first music when he was five, and produced a steady stream of new creations throughout his life. The appearance of the Boyd Neel Orchestra may have played a role in the creation of the Simple Symphony. In the year of the orchestra’s founding, Britten sifted through piano pieces and songs he had written between the ages of nine and 12. Selecting eight themes that he considered too good for the waste basket (two for each movement), he used them as the building blocks for this thoroughly engaging work. He completed it in just seven weeks, from December 1933 to February 1934, and conducted the premiere himself, leading the Norwich String Orchestra, on 6 March 1934. A simple listing of the movement titles tells you what you need to know about them: Boisterous Bourrée; Playful Pizzicato; Sentimental Saraband; and Frolicsome Finale. Britten modeled the titles of the first and third sections on the Baroque dance suite, but he made no attempt to reproduce the music of that era in any direct way. Ravel’s two piano concertos were his final major works. Even though he composed them during the same period, 1929-1931, they are quite different from each other. The Concerto in G Major for two hands is bright and breezy; the Concerto for the Left Hand in D Major is one of the most sombre of all his works. One thing they share is the influence of jazz, which was popular in France at the time, and which he had come to know firsthand during a concert tour of North America in 1928. Other composers such as Milhaud, Martinů and Stravinsky felt its influence, too. His plan was to give the first performance of the solo part himself, but despite a great deal of practicing, he reached the conclusion that it lay beyond his powers. He decided that his role in the premiere would be that of conductor instead, and chose the celebrated soloist Marguerite Long to perform the solo honours. The first performance took place in Paris on 14 January 1932, with Ravel conducting the Lamoureux Orchestra. He and Long took the concerto on tour, introducing it in several cities across Europe. The opening movement balances the playful and the dreamy. Ravel deployed his orchestra with a maximum of colourful ingenuity. Complete and utterly bewitching contrast comes in the slow movement. Marguerite Long called its principal theme, introduced unaccompanied by the soloist, “one of the most touching melodies which has come from the human heart.” After a climax of restrained melancholy, the music gradually and nostalgically winds down to a peaceful reprise of its beginning. The finale is a headlong chase led by the soloist. “With Handel and Haydn, he is the healthiest of all composers”—Harold C. Schonberg. Through his opera and symphonic poems, Bedrich Smetana (1824‑1884) founded the Bohemian (later Czech) branch of the folk‑flavoured musical movement that had sprung up in Russia. Dvořák took up where Smetana left off, bringing the style to the height of its sophistication and worldwide popularity. The early phase of his career was unpromising. He spent many years barely making ends meet by performing everyday musical tasks, such as serving as a church organist and playing the viola in a dance band. All the while, he composed a great deal, gradually working through the influences of Beethoven and Wagner, and learning how to submit his enormous flow of invention to professional discipline. His big breakthrough came in 1878, when the first set of Slavonic Dances took Europe by storm. People fell in love with these approachable, exotic works, and he was quick to oblige the clamour for more such music. The influence of his Czech folk heritage is heard in many of his mature creations, though nearly always (as in the Slavonic Dances) through themes he composed himself, rather than authentic native melodies. Dvořák composed a substantial amount of chamber music, favouring the string quartet above all. From 1862 to 1895, he created 14 of them, virtually the same total as Beethoven. No. 12 is by far the most popular. This flows in large degree from it being equal in “folksiness” to the Ninth Symphony, which he had completed one month before. At the suggestion of his personal assistant, Josef Kovařík, Dvořák spent the summer of 1893 in the farming hamlet of Spillville, Iowa, where Kovařík had been born, rather than returning to Europe. Spillville’s 300 residents were Czech immigrants, and the intensely homesick composer felt right at home in their midst. He conducted a church choir and played its organ for services, took long early morning walks during which he noted down the songs of birds, fished the Turkey River and consumed vast quantities of his favourite pilsner beer. His happiness proved a powerful stimulus to creativity. In just 16 days he composed String Quartet No. 12 (known thereafter as the ‘American’ Quartet). At the end of the sketch he wrote, “Thanks be to God, I am satisfied, it went quickly.” Such was the concentration and surety of its creation that the manuscript score contains hardly any corrections. Inspiration continued unabated. Six days later, he finished the sketches of another equally splendid chamber work, the String Quintet, Op. 97. He was so eager to hear the new quartet that he pressed three members of the Kovařík family into joining him to give it an informal run-through. He played the viola part, and Josef the cello. The Kneisel Quartet performed the formal, public debut in Boston on 1 January 1894. In the prayer-like slow second movement, he gave full vent to his longing for home. The powerful climaxes here mark a substantial increase in forcefulness over those of the opening movement. The third movement is a dynamic and joyous scherzo whose great charm masks its intricacy and ingenuity. Dvořák, for example, constructed it solely on transformations of the opening melody. Josef Kovařík revealed that Dvořák took some of the melodic material from the song of the scarlet tanager, a bird he had encountered while walking outside Spillville. The boisterous finale opens with a vivacious chugging rhythm that calls to mind the locomotive, a machine that fascinated the composer. Czech musicologist Jan Smaczny has drawn a parallel between the sweet-natured second theme and a service in the Spillville church.